Aliens vs. Predator is another cool CCG not on this website. That's the main reason I came here in the first place. I have a lot of Yu-Gi-Oh! Cards that I would like to trade away for Aliens Predator CCG cards. 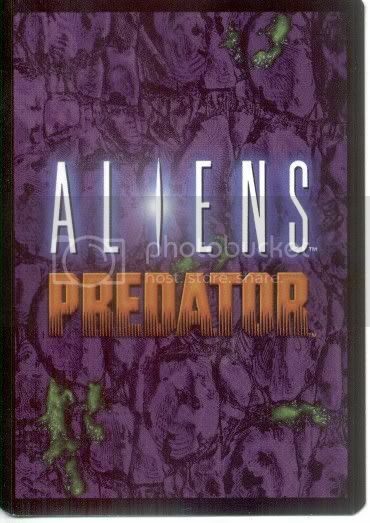 it's aliens predator ccg, and if you have them to offer me. In return I'll send you yu-gi-oh! cards. ill try my best ny perticular ones you want? ill see what i can do but do you have any good alien vs preadtor ccg sites to recomend? It was last updated like 6-7 years ago. My friends and I were so into that game. I've still got lots of the cards. no kidding, I' ve finally gave this card game a home here, contributed all the info and stuff. since this game has already been added to the site. You can play this game online for free by using a program called Gatling Engine which can be obtained @ http://www.ccgworkshop.com.